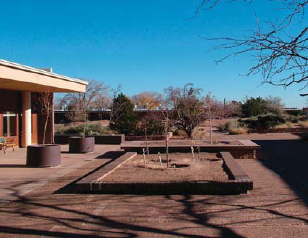 The Painted Desert Community Complex is considered to be an exceptionally important and nationally significant example of Park Service Modern Design, an architectural philosophy that pervaded the National Park Service between 1956 and 1966. Associated with the renowned architecture firm of Richard Neutra and Robert Alexander, the Complex also represents modernist landscape design ideals where vegetation played a critical role in defining spaces, organizing circulation patterns, and contributing to an educational visitor experience. This Cultural Landscape Report provided recommendations to guide the rehabilitation of this important complex, originally designed to be an "Oasis in the Desert," which now suffers from years of deferred maintenance, lost plant species, and lack of irrigation. 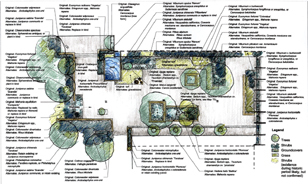 Great attention was given to finding appropriate drought-tolerant replacements for the historic plant palette and suggesting rainwater harvesting systems that can capture precious rainfall.